These are just some codes for NES games I made up. These codes can be used on a actual Game Genie or an emulator such as Nestopia or FCEUX. I'll keep editing this post for when I find new codes. IPLULS - You can only jump once until you go into a corner. ESZXYP - Freezes all enemies, makes coins stay on screen when collected, and is impossible to beat levels. ZVPKXN - Makes the bottom right corner of Mario invisible, and the game will crash at one point. EPPSTL - Edits World 1-1 Music to be Castle Boss Theme, and the terrain to change a bit. EEIIII - Enimies act/look different, and the ending roulette is different as well. YEAAAA - Play game without music (Why would you want to do that? :P). The YEAAAA code is also a famous one for Super Mario Bros.
You need to rename the file from "Game Genie.nes" to "gg.rom" for it to work with FCEUX and FCE Ultra GX. You can also find Emulators at The Emulator Zone. And you can find most ROMs (The game files) from Coolrom.com. NOTE: Downloading ROMs is ILLEGAL. Download them at your OWN risk. I have removed the Game Genie ROM download because of this. PM me if you want it. Last edited by Mari0Maker on 04 Mar 2014, 22:03, edited 6 times in total. DOLAND <Nintendo Land, or Dolan D.
I'll try them out for you if you want. I probably wont be able to use all of them though, due to Game Genie only having a small selection of letters. And I've seen that list on Game Genie.com before, but what I'm trying to do is creative, although those codes are helpful. PALPIG: Random blocks/letter-blocks scattered about, mostly non-solid and vines, but occasionally solid blocks (and even re-palleted blocks and working pipes!) 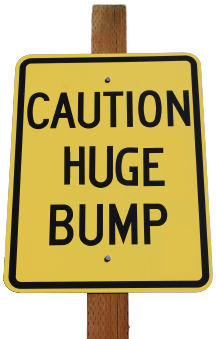 does not affect underground levels, water levels, or castles. YSYTTA: Mushrooms/1ups move normally, but as if there were more platform under them. Nice codes! I'll play with them myself sometime soon. I've been putting them backwards. Also, have you heard of the best smb code? YEAAAA. I didn't make it, but it's the best. Also also, all of the codes I give you are for smb + duck hunt. I do have one very important question here... How did you get the GG ROM to work on Nestopia? I seem to be having troubles using it and the game I want to run in tandem. Most emulators have built in Game Genie options, don't they? HAPPYFACES wrote: I do have one very important question here... How did you get the GG ROM to work on Nestopia? I seem to be having troubles using it and the game I want to run in tandem. It's the edit tab at the top left of the screen. Yep, heard of the "YEAAAA" code. A lot. I also edited my main post, clarifying about ROMs. What about the wii HomeBrew NES emulator called FCE Ultra GX will it use homemade codes or not? 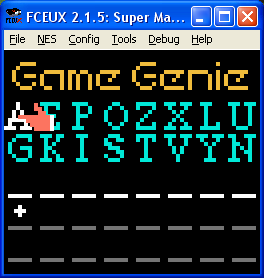 Well, I haven't worked too much on Emu's with Wii (Mainly hacked my Wii to muck around with Call of Poopy and screw with codes and stuff) But since FCEUX has support for the actual Game Genie ROM, I assume your Emu might as well too. But you're asking on the wrong forum. Try GBAtemp.net, google search it. Yep, it can. That's where I make most of my codes. Just put the "gg.rom" on you SD Card in the "fceugx" folder (NOT IN THE CHEATS). Then just turn the Game Genie option "ON" in FCE Ultra GX on the Wii. HAPPYFACES wrote: Then you my friend, are my friend :3 Got Mario Kart? I really hope this conversation turns into Mario Kart Custom Tracks. Besides, there's already a kart racing topic. Mari0Maker, have you tried my codes? Nope, don't have it, and I don't even have Internet on my Wii. But, I plan hope to get it for my B-Day. I will be using CTGP (Custom Tracks Grand Prix) as well, which will be the main reason why I'd get it, as I've borrowed it before and was close to %100 percenting it. And as Camewel said, yes, lets not derail this topic. We'd need a Wii/Wii U Hacking/Modding thread. Which I may make unless someone beats me to it. And on topic: FGCUEX Has become my go-to Emu when I wanna mess around with Game Genie. Thanks for the info, whoever-it-was-that-talked-about-it. I did all that and I have the old Multi Game cart that Came with the NES Super Mario Bros. + Duck Hunt and I just don't know if I could use those Super Mario Bros. Game Genie codes for it since this is two games in one. I hacked the wii with the easiest hack which was the Banner Bomb hack. I refuse to go any further off topic so I will say that it's a bad idea to use a Game Genie on an original NES system. I had a friend (granted via the internet) who broke his NES with it, because it bends pins or something. He had to have the Game Genie in to play. I WANT THE LINK TO THE ROM PLEASE! MegaSuperab wrote: I WANT THE LINK TO THE ROM PLEASE! I don't think it is legal to link a rom in forums. You could easily find one if you actually tried looking. Although, this is going off of me getting told in another forum that I shouldn't link them. Well, ROMs are illegal in the first place. So yeah, you shouldn't link them anywhere. Roms aren't technically illegal, just the act of distribution/download of roms are illegal. Although if you boot over a rom yourself for your own personal use then its perfectly* legal. *the whole thing is more of a grey area by itself, and I never really had to deal with any of this myself anyways so be warned. All codes made with SMB/Duck Hunt on original Nintendo Entertainment System. I will post more when I get a phone, can bring my NES over to my cousin's and have internet there, get internet here and laptop fixed or this tablet again, which is on DATA.